When I heard the intro to this episode of The Layover with Anthony Bourdain, I knew it was going to be good. If you can overlook a few erroneous factoids and Bourdain’s less-than-perfect French accent, he is absolutely spot on. 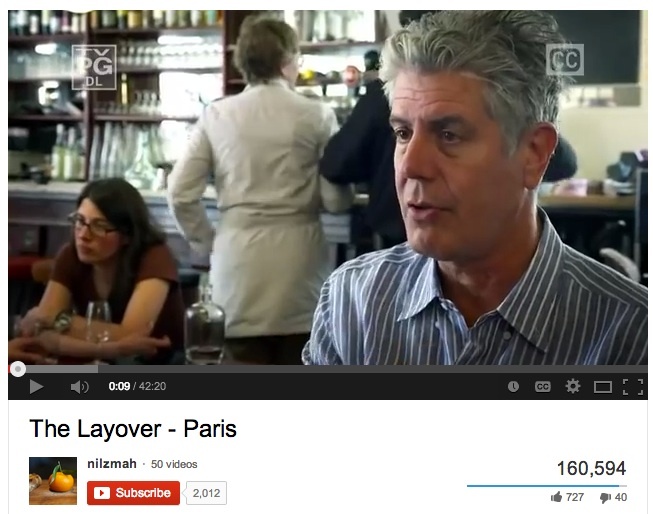 What Bourdain is saying is don’t think you have to pack every last site into your visit. “Forget Notre Dame,” he says. If you want to cram it all in, aim to cram in lots of food and drink, interspersed with lots of walking, but not landmarks. Or at least minimize the dedicated landmark time (Bourdain reluctantly allots 7 minutes to Notre Dame in the end). And don’t just hit up the touristy restaurants and cafés. Venture out to some of the up and coming neighborhoods–which generally have the added benefit of being cheaper. Le Dome‘s seafood platter (14th arrondissement)–who wouldn’t want to try it after seeing his pure delight in devouring it despite his PTMD (post traumatic mime disorder)? Though Bourdain’s beloved blood sausage macaroons I’m happy to skip…. I highly recommend this video, particularly for the foodies among you. You can practically taste the food along with Bourdain. I would go as far as to say it’s required viewing for anyone planning a trip to Paris in the near future, and certainly for anyone planning a shorter or first visit to the city. His no-nonsense style (for example, his description of the “obligatory must-have if-you-don’t-order-it-you’re-f*ing-nuts cheese plate”) is refreshing and allows for one of the few honest Paris accounts I’ve seen. So go ahead. On your next trip to Paris, try planning your visit around your food and drink goals. Map out your daily itineraries based on where you want to eat and drink, and you won’t be disappointed. And if you walk from one stop to another, you are guaranteed to have a fantastic stay.